I’ve wanted to be a writer ever since I can remember. In Middle School a few students and I started a school newspaper since we lacked one and felt the High School paper was ignoring us. In High School I took journalism, and sat on the Editorial Board of the very same paper I felt snubbed us (I even covered my first election there in 2004 and a teacher’s contract dispute! ), I edited the interactive yearbook and the poetry magazine… so I was a literary nerd! On came college where I enrolled to study journalism and broadcast and that’s where things fell apart. Life intervened and tragedy struck my family… over and over and over again: we lost my brother and both of my maternal grandparents (whom we lived with and helped raise my sister and I) within the course of a few years. I was in a bad place, and my family decided to move across the country and start over, I reluctantly joined them and trekked from New Jersey to Arizona in 2006. With the need to pay rent being paramount I shoved aside my collegiate aspirations for a career in sales. I thought my dream was over. Life went on though and I met my wonderful wife, married, bought a home & we were blessed with our amazing kids. But it still nagged at me.. I wanted to write, and I wanted to write commentary on the news and the politics happening around me. 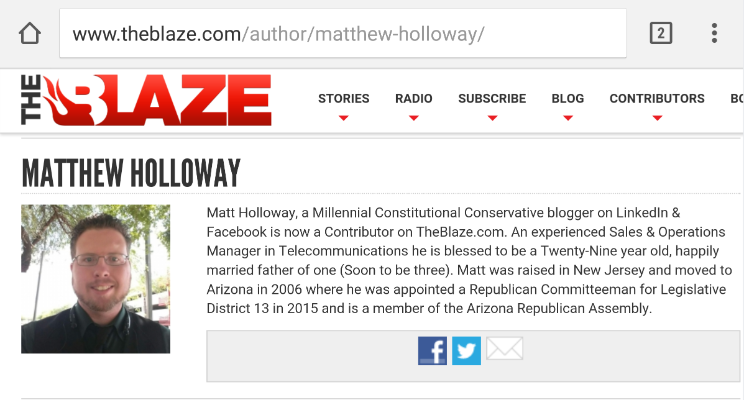 Now, I had been reading TheBlaze.com and watching TheBlaze TV since they launched on September 12, 2012. TheBlaze is a great organization that I always wanted to work for but seemingly couldn’t find the front door into. I began writing on a public Facebook page and blogging here on LinkedIn in 2014-2015 but it seemed like a barely justifiable hobby until February 4th 2016 when I started reaching out to every professional I could find at TheBlaze via LinkedIn asking how I could get my content in front of the right people. Catherine Astalos who was National Account Director at TheBlaze, recommended I apply to become a Contributor. After a lot of revisions (I mean a lot of them, just ask my editor) I anxiously submitted my first story to TheBlaze regarding the National Popular Vote Interstate compact. I averaged about one story a month through June until I received permission to cover Donald Trump’s Phoenix Rally on June 18th. Admittedly the live-stream didn’t go as well as I’d hoped but it was the realization of a dream I’ve had since I was 11 years old! 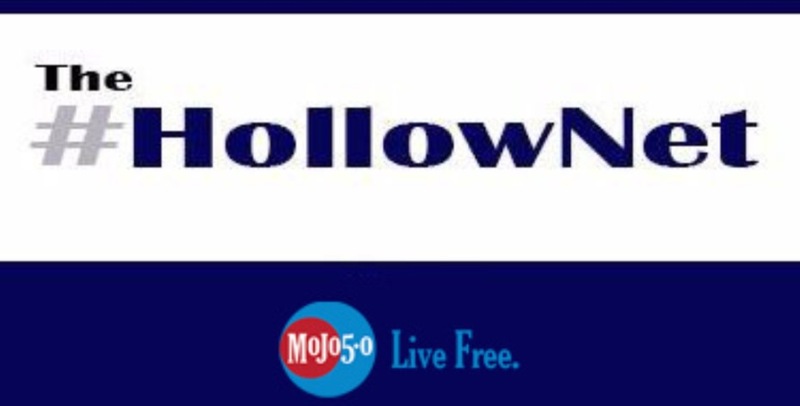 Soon after that I covered an Anti-Clinton protest in Phoenix, interviewed Dr. Kelli Ward about her run against Sen. John McCain and just recently launched my own blog on blogspot. I've also had the great pleasure to be a guest to The Chris Merrill Show on 550KFYI here in Phoenix. Just this month I posted my latest story to TheBlaze titled “A Constitutionalist argument for Trump: Congress'​ ability to impeach”. It has been an absolutely exhilarating ride and I have so many people to thank: starting with my family of course and my supportive Wife. LinkedIn truly made this all possible for me, had I not been able to connect to Catherine Astalos none of this would’ve happened, so thank you LinkedIn and thank you Catherine! Thank you to the Editors at TheBlaze who made my work shine and gave me the support I needed to succeed: Jake Hancock, Sarah Rivette & Kate Scanlon are the best and brightest I’ve ever seen. Thank you also to Mateen Aini who with Jake made my Facebook Live streams possible. Everyone at TheBlaze has shown amazing patience and guidance to me and I will be forever grateful. My thanks also go out to Chris Merrill for giving a new commentator some time! Chris provided me with fantastic exposure and always challenges my conclusions, making me better myself. · Be Persistent- “Never, never, never, never give up.”- Sir Winston Churchill. Persistence prevails, hard work and steadfast dedication are the keys to success. · Be Faithful- “I am not called to be successful, I am called to be faithful” –Mother Theresa. Funny enough given that being faithful and trustworthy leads to success, it is a product of them. · Be Humble-“The less people speak of their greatness the more we think of it.”- Sir Francis Bacon. It may be ironic citing humility as a strength while telling the story of what I consider my chief professional achievement so far but, humility in your day to day life is key. · Be Grateful- “Yes, every day will end and everyday will start with a grateful prayer and a thankful heart.”- A Muppet Christmas Carol. Be grateful for everything in your life, for every bump and bruise and every triumphant moment; for it is these moments that have molded you and formed you. Don’t give up on that dream of yours, no matter how much time and adversity have passed… You can still do it! Start right now, literally RIGHT NOW! Don’t linger on what could have been go to sleep each night with a grateful prayer and a thankful heart knowing that you at least TRIED! Thanks for reading.